6 weeks for design concept and documentation. With increasing urbanisation and high density living, children have less exposure to venture outdoors and explore the natural environment. Many of the tactile qualities experienced in nature are regularly overlooked. For instance, how do you replicate the feeling of crunching leaves under foot, or the sounds of leaves whispering in the wind in a constructed space? Much of the outdoor area associated with the center was unable to be used due to a large drop in levels. To increase the playspace area, the new design incorporated these previously out-of-bounds areas with careful grading and the creation of a ramped path. 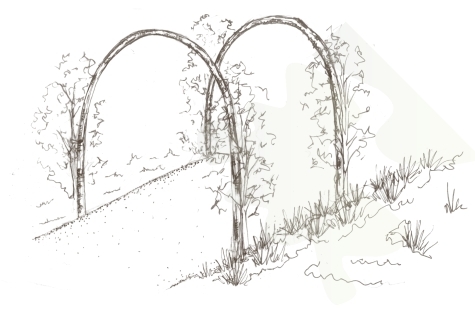 The design incorporates nature as a mainstay of the playspaces, with areas featuring a variety of activities to support the growth and development children. Extending from the baby playrooms is an open area of synthetic turf, a crawling tunnel, sensory garden and large deciduous shade tree. From the older children's playrooms and large verandah area, a flexible and multi-use space opens adjacent to an open cubby and double sandpit. Not having a formal separation between the two age areas encourages interaction between all children – although we have used bamboo to create an informal barrier. A large deck incorporating an existing tree is located at the highest point of the main playspace, providing views over the entire ground and enabling children to 'be seen and see others' whilst playing independently. This can also be used as an outdoor class area. A large kitchen garden is also provided as an excursion space, with a shady pergola planted with a passionfruit vine, raised vegetable gardens, and fruit tree orchard around the boundary.